As the Raver says, not as good as Lyra 2, but still one of the best Speccy ,multipart demos , hmm i love especially music in this.....The border effectoz in the zecond part is very cool...watcha !!! these guys are from Torun. One of the oldschool kind of Speccy demos I love! A true classic!!! it was a Shock and it is still a Shock. anyway, all code was done by Kaz, except Mat's guest part. later they moved to Sam Coupe and then to amiga. Kaz was then kicked out of the ESI group and they vanished (but never stated anything like the end os ESI). Well... "kicked out" is a bit of overstatemet ;) He left because of some internal differences (or maybe because a lot of differences). Unfortunaltely when you try to do bussiness there is no place for fun. mat: are you behind this demo also? lai: wow! I didn't thought this one was stored anywhere ;) Yes. That was one of my attempts to do something relaxing - GBC was quite nice platform to code. 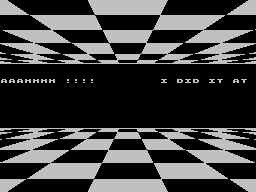 This (together with Lyra II and Pentagram's LSD) was the classic Polish demo that inspired many Russian (Ukrainian, Belorussian) sceners - Code Busters and Dream Makers just to name a few. When it appeared in Russia in early 1993 (imported and disked by some lockal hacker who obviously had contacts with Poland), there was nothing like that before. Everyone was literally shocked and I remember ZX Review article where they suggested using multicolor part of this demo as a compatibility test for numerous Spectrum clones. and one of the best classic stuff for ZX Spectrum 48K and AY interface. All of us studied at them. Whoa, sum heavy tech there. Just running it on a 48k+AY. Very good classic that runs in TK90X+Explorer! true gem that i've just discovered! BTW. The soundtrack in the third part is Pulstar by Koto, not DJ Mendez. Ludzie ogarnijcie się. page created in 0.017312 seconds with 15 queries.